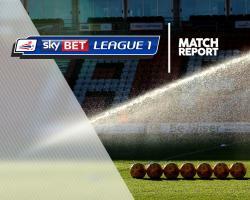 MK Dons earned their fourth away win of the season with a 2-0 victory at struggling basement boys Oldham. Ben Reeves and Kieran Agard were on target as the visitors punished defensive errors either side of half-time. Dons forced an early save as Ryan Colclough cut inside from the left and tested keeper Connor Ripley with an angled shot. Oldham almost struck when Freddie Ladapo let fly from 18 yards, but keeper David Martin tipped smartly over the bar. Ripley was at fault for the opening goal after 36 minutes as he allowed a 25-yard shot by Reeves to squirm through his dive and trickle over the line. The home side came close to netting an equaliser just after half-time when Peter Clarke's overhead kick came back off the bar. Dons doubled their lead 10 minutes after the break as Samir Carruthers whipped in a left-wing free-kick and Agard glanced in from eight yards. It could have been worse for Oldham - who have scored just twice in six home games - but Agard hammered a good chance against the bar.